Acne is a very common skin condition characterised by comedones (blackheads and whiteheads) and pus-filled spots (pustules). It usually starts at puberty and varies in severity from a few spots on the face, neck, back and chest, which most adolescents have at some time, to a more significant problem that may cause scarring and impact on self-confidence. For the majority it tends to resolve by the late teens or early twenties, but it can persist for longer in some patients. Acne can develop for the first time in patients in their late twenties or even the thirties. It occasionally occurs in young children as blackheads and/or pustules on the cheeks or nose. Acne results from overactivity of the sebaceous (oil producing) glands. These glands are under hormonal control. At puberty there is an increase in hormonal activity on both men and women that causes these glands to produce an excess of oil. At the same time the dead skin cells lining the pores do not shed properly and clog up the follicles. This produces blackheads and white heads. There is also an acne bacterium called Propionibacterium acnes that lives on everyones skin, usually causing no problems, but in patients prone to acne, these bacteria tend to multiply. This triggers inflammation and the formation of red or pus-filled spots. Some acne can be caused by medication; for example some of the contraceptive injections or pills. Also body-builders can take tablets with certain hormones/steroids, these patients can develop severe acne and sometimes with severe acne scarring. 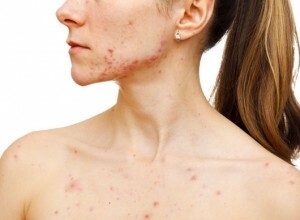 PCOS or polycystic ovarian syndrome is a condition in female patients that causes acne. If the periods are irregular and the female patient developed excess facial hair and moderate to severe acne the Doctor may suggest a blood test to check the hormone level. Diet and water and not known to improve or disprove acne. Skin care is very important in patients with acne. Certain facial cleansers like glycolic/salicylic/lactic acid should be used twice daily. Moisturisers and sunscreens should be oil -free or non-comedogenic. Fake tan will occlude the pores and cause/worsen acne breakouts and should be avoided. Make-up should be mineral as the minerals allow the skin to breathe. Excessive sweating for example in the gym needs to be washed away as soon as possible so bring your cleanser with you and shower in the gym after exercise rather than waiting to go home as the sweat can block the pores. Some topical treatments will be prescribed by your Doctor if the acne can’t be controlled by over the counter products. There is a wide range of anti-acne agents such as benzoyl peroxide, sulphur lotion, antibiotics, retinoids, azeleic acid and nicotinamide. Some topical products can be very irritating to skin so your Doctor will generally recommend a proper skin care routine to go with them and this must be carefully adhered to. Some types of contraceptive pills help females who have acne. The most effective contains a hormone blocker (cyproterone acetate ) which reduces the amount of oil the skin produces. These tablets increase the risk of blood clots which can be dangerous. There is a greater risk in patients who smoke are overweight or have a positive family history of blood clots so a proper consultation with your Doctor is required. The OCP can also trigger low mood/anxiety so a carefully family history needs to be taken. This will be prescribed along with a proper skin care routine recommended by your Doctor. Your Doctor may recommend a course of oral antibiotics along with a suitable skin care regime. This is a very effective treatment for acne. However there a number of potentially very serious side effects so it is rarely a first-line option for the treatment of acne and will only be prescribed after careful consideration with your Dermatology Doctor and if no other form of acne treatments has been successful. The acne can return after a full course but some patients get a long-term remission (a few years) from the condition. A monthly visit with your Dermatology Doctor will be required and frequent blood tests are needed to monitor the progress of the treatment. Treatment courses are generally 6 months but may be much longer. Anxiety or depression can be triggered and patients with a family history of anxiety/depression are more likely to develop same. If a female patient gets pregnant on this drug this will required an abortion/termination of pregnancy because of the serious abnormalities that the unborn child will develop. Any female of child-bearing age should be on a double form of contraception during the course and contraception needs to be continued for 6 weeks after stopping the drug. Drinking alcohol while on medication can seriously affect the liver so should be avoided. Patients who exercise a lot can experience severe muscle aches/pains may have to reduce to stop exercising while on the drug. It can extreme sensitivity to sunlight/light and long-term redness and broken veins can develop after a course. All patients must wear a daily sunscreen and re-apply throughout the day and certain other products will be recommended by your Doctor while on the drug. It is worth mentioning here that this drug is a widely prescribed drug for acne and most patients experience very few problems but it has to be prescribed appropriately by your Dermatology Doctor. There is a wide variety of other treatments to treat acne. Skin peels, IPL (blue light), pulsed dye laser, Scarlet RF, medical microneedling are among the treatments offered for acne and acne scarring( see under treatments section). These treatments are very effective and often used in combination and/or with anti-acne drugs to improve texture and scarring. The treatments are also an alternative for patients who do not wish to take drugs. Co2 laser and phenol peeling would be for severe acne scarring and would require time off work. It is very important to have a Dermatology consultation first to discuss realistic expectations and what the best combination for the individual patient is at that time.